Small, water-rich near-Earth asteroids can be captured by spacecraft, allowing their resources to be extracted, officials with the new company Planetary Resources say. 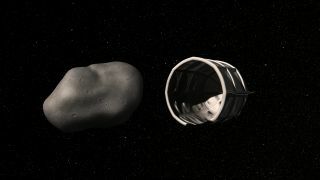 "If you look at space resources, the logical next step is to go to the near-Earth asteroids," Planetary Resources co-founder and co-chairman Eric Anderson told SPACE.com. "They're just so valuable, and so easy to reach energetically. Near-Earth asteroids really are the low-hanging fruit of the solar system." "We're going to go to the source," Anderson said. "The platinum-group metals are many orders of magnitude easier to access in the high-concentration platinum asteroids than they are in the Earth's crust." "When the availability of these metals increase[s], the cost will reduce on everything including defibrillators, hand-held devices, TV and computer monitors, catalysts," Planetary Resources co-founder and co-chairman Peter Diamandis said in a statement. "And with the abundance of these metals, we’ll be able to use them in mass production, like in automotive fuel cells." In addition to Page, Planetary Resources counts among its investors Ross Perot Jr., chairman of The Perot Group and son of the former presidential candidate; Eric Schmidt, executive chairman of Google; K. Ram Shriram, Google board of directors founding member; and Charles Simonyi, chairman of Intentional Software Corp., who has taken two tourist flights to the International Space Station. Planetary Resources, Inc. plans to send robotic probes out to prospect near-Earth asteroids, gauging their potential stores of water and platinum-group metals. "We're out there right now, talking to customers," Anderson said. "We are open for discussions with companies — aerospace companies, mining companies, prospecting companies, resource companies. We're out working in that field, to really open up the solar system for business."